Have you ever wondered what other artists and designers talk about behind studio doors? Do you ever think about the types of risks, obstacles, and failures creative entrepreneurs encounter before achieving their goal? Have you ever noticed how systems oppression impact creative industries and wondered if there's any way to fix them? Amanda Mollindo and Mina Vargas have been considering those questions, too! And they're sitting down with artists, designers, and creative entrepreneurs who are demographically underrepresented in their field to learn about their experiences. Tune in to hear heartfelt stories and no-nonsense advice from creators who are forging their own path to make a difference! From launching her own business to battling endometriosis, Charissa Lucille uses creativity to infuse meaning into every aspect of her life. A self-taught photographer, zinester and entrepreneur, Charissa works tirelessly to uplift the voices of others. Between working a full-time job outside of the arts, running Wasted Ink Zine Distro, and organizing Phoenix’s annual zine fest, she still finds time to make personal work. 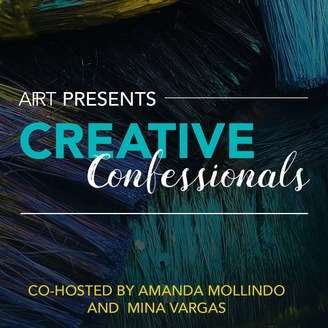 In this episode of Creative Confessionals, Charissa shares how she prioritizes her many responsibilities, even through illness, pain, and surgery caused by endometriosis. Tune in to hear some freakin’ inspirational words of wisdom from Charissa’s Mom, learn about the inclusive and diverse world of zines, and why community is so important to this incredible artist! Charissa Lucille is the founder of Wasted Ink Zine Distro and an organizer for the Phx Zine Fest. She uses different art mediums like zine making, photography, and writing to share her ideas and to tell her story. She represents hundreds of artists through her zine distro and self-publishing in order to inspire change and create community impact. Charissa is currently working on a zine about endometriosis and how it's impacted her and her mother's life. You can find Charissa at Wasted Ink Zine Distro having a cup of coffee and reading zines. Zines about Endometriosis from Wasted Ink Zine Distro and Charissa’s personal collection. Don’t miss the Phx Zine Fest on October 28 at Unexpected Gallery at 734 W. Polk Street in Phoenix, AZ. Click here to learn more about the event!